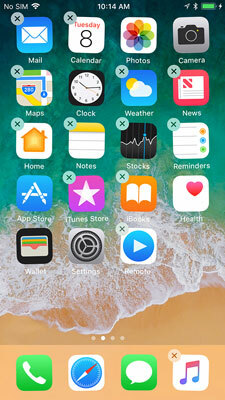 iOS 11 lets you delete many of the Apple apps that came with your iPhone, if you care to, as well as any third-party app you no longer want or need. Tap the little x in the upper-left corner of the app you want to delete, as shown. You can download any app you’ve purchased again, for free, from the App Store. So deleting it means only that it’s gone from your device. You can always get it back by downloading it again unless, as previously stated, the app is no longer available in the App Store. Did you notice that Photos, Camera, Clock, App Store, Health, Wallet, Settings, Phone, Safari, and Messages may be jiggling (you may not be able to tell from the figure, but they’re jiggling), but they don’t have little x‘s? Those (along with Find My iPhone in the Extras folder on the second Home page) are the Apple apps that can’t be removed. Just remember that deleting an app from your iPhone this way doesn’t get rid of it permanently. Even then it’s not really gone forever because you can download purchased apps again for free. And, of course, you can download free apps again for free because, well, they’re free.